HONG KONG, CHINA--(Marketwired - Mar 16, 2014) - Goodman Group ("Goodman" or "Group"), the global integrated property group which owns, develops and manages industrial space, today raised a record HK$800,000 at its third annual Goodman Interlink Magic Mile Charity Ramp Run held at its flagship property in Tsing Yi. 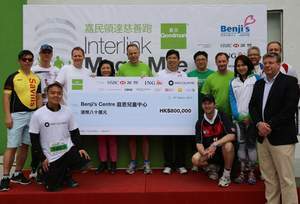 The funds raised will be donated to Benji's Centre, a charity which provides professional speech therapy services to children and teenagers from low-income families in Hong Kong. 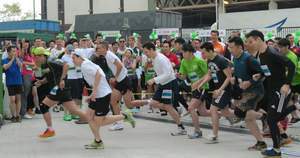 During the event, more than 300 competitors raced in front of cheering spectators to complete the 15-floor cargo ramp of Goodman Interlink, a landmark warehouse and distribution property in Hong Kong's strategically important Tsing Yi port district. Participants included Goodman's staff, customers, business partners and their families, as well as individuals who wanted to be part of the worthy cause. Mr. Philip Pearce, Goodman's Managing Director, Greater China, said, "We are very proud to be holding this event for the third time to raise funds for Benji's Centre, a charity organization we are very honoured to support. This year, we are especially delighted to have raised a record amount of HK$800,000, which is more than the first two years combined. Mr Pearce added, "We obviously couldn't have achieved this without the generosity of all the sponsors and participants, and for that, we are extremely grateful. Last but not least, I would like to thank the customers at Goodman Interlink for closing their operations this morning to allow the ramp run to take place today." The event this year has attracted a record number of sponsors, with HSBC, ING Bank and Macquarie as the platinum sponsors and Allen & Overy, CBRE, Crédit Agricole Corporate and Investment Bank, King & Wood Mallesons, Knight Frank, Savills and Standard Chartered Bank as gold sponsors. Founded in 2004, Benji's Centre aims to help children and teenagers in need of professional speech therapy from low-income families, and enable them to integrate into the community. To date, over 1,700 children and families have benefited from the Centre's services. Goodman's global property expertise, integrated own+develop+manage customer service offering and significant fund management platform ensures it creates innovative property solutions that meet the individual requirements of its customers, while seeking to deliver long-term returns for investors. The Goodman Foundation supports the needs of the under privileged in our community as well as providing support to our communities in times of need. Its focus is on social change and improving the standard of living or the health of our community by providing practical assistance by way of capital expenditure for equipment, funding of projects, warehousing or office space or the expertise of our people. Goodman employees are engaged in providing their time to volunteering projects or fund-raising for a cause. The Goodman Foundation has supported the Hong Kong team in funding the establishment of a Kid's Learning Corner, the addition of full and part time speech therapists and speech therapy lessons for the many children who are supported by Benji's Centre. Benji's Centre was founded in 2004. It is the first and only charitable organisation providing specialized one-to-one professional speech therapy to children and teenagers from low-income families. Currently there are over 350 children receiving service and have helped over 1,700 children since its establishment. 70% of them enjoy free remission, whilst the remainder pay the fee equal to half of the private therapy charge. Currently over 200 children remain on the waitlist.